I wrote this yesterday as part of my staff newsletter. 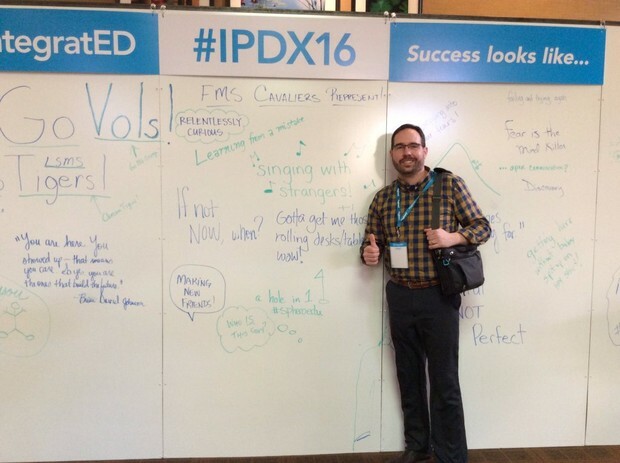 My experience at #IPDX16 was excellent, and it wasn’t only the conference. The city of Portland offered lots of experiences. Here is one of them. While I was very busy presenting and learning during the day, I did have some time to explore the city of Portland with colleagues and on my own. One of the most interesting experiences was using Uber to get around. It is a self-organized taxi service. You use the Uber app to connect with a driver. Anyone can be a driver as long as you have a reliable car. Once the driver sees your request, they come over within a couple of minutes. Payment is handled through the Uber platform, similar to PayPal. As I used this new service, here were a few observations I noted during the time. It can be both scary and fun to try something new. When a colleague told me to try Uber, I initially resisted. “Who’s the driver? How do you know they are safe?” They reasoned that you didn’t really know the taxi driver either, and that Uber has improved safety and reliability. So I took a chance, and it was positive. My first driver was welcoming, his car was clean, and he drove me to my destination quickly. In fact, all four Uber experiences were consistently good. Prior to Uber coming into town, I was told that the Portland taxi service was not something to brag about. They weren’t timely about picking you up and were not always the most pleasant people to be around. Now that the traditional taxi service is not the only game in town with Uber, they have had to step up and improve their service. During my extended wait, one car that seemed to match the description of a driver pulled up to the curb. As I reached for the door, another person started getting into the front and asked, “Umm, what are you doing?” At first dumbfounded, I quickly realized that I was attempting to get into a stranger’s car! My eventual driver explained that this happens often, and to look for the “U” symbol in the window to confirm they work for Uber. So What Might Educators Learn from Uber? Here are some possible connections between Uber and education. It can be both scary and fun to try something new. Thinking about change, such as our upcoming peer coaching/observations, I imagine we might be feeling the same way. There is risk involved, but also the potential for reward. Having spoke with other schools that have engaged in peer observations, it sounds like the risk is worth it. Competition can increase quality. If you know me at all, you know that I am a strong advocate for public education. I do not agree with the approach taken by supporters of school choice and the voucher program. That said, public education is feeling this pressure to increase our effectiveness, which has led to more awareness and effort. We have to keep innovating in order to provide the best education possible. Technology has it’s limits. We’ve all experienced the lack of a wireless signal, a slow Internet, and login problems. I am glad that we don’t rely too heavily on digital tools to drive our instruction. Pedagogy usually comes first at our school. Never assume. Observing student actions through an outsider’s perspective can help us avoid making snap judgments about the issue at hand. We can become aware of our own biases by asking some simple questions to develop a better understanding of the situation. I do this sometimes in my instructional walks. Also check out John Spencer’s smart post, offering a comparison between education and the city’s food truck industry. Next Next post: Do I Really Need an Apple Watch?